Here is a story that highlights an individual who is culturally intelligent and practices regular reflection of his personal attitudes and behaviours. This is an example of someone who realised they had some gaps in their cultural knowledge and skill-set and could do things differently. Adam needed to hire an offshore programmer. His experience with offshore staff had generally been positive but he felt that it could be improved. He began by looking at his interview and recruitment techniques, thinking of how he could do them differently with greater reach and improvement; and perhaps attract and hire a different caliber of talented programmers. He reviewed the job description and requirements and also began to think about how he could accommodate for the cultural differences that he knew were also having a significant impact, not just in terms of recruitment but also in retaining offshore staff. He also became aware that perhaps his interview style, non-verbal behaviours (all interviews are conducted via Skype) and structured questions might be limiting the interviewees’ ability to truly display their skills and expertise. Rather than look externally for assistance and feedback, Adam decided to leverage on the diversity that existed within his staff and colleague pool; he engaged the assistance of Raj, a Systems Analyst. Raj was younger than Adam, but closer to the age of many of the interviewees and was of Indian decent. Although Raj hadn’t had any recruitment experience he was a well-respected team member and very keen to assist Adam. Both Adam and Raj believed the strategy to be mutually beneficial. There was greater sharing of knowledge and skill-sets between the divisions of seniority. A point that I would like to make here is that there are often many opportunities that produce occasions to leverage the diversity that sits within our offices and organisations. We just have to think a little differently. Next time you find yourself requiring assistance, looking for help to solve a problem or wanting to make a change to current the ‘state of play’; I encourage you to think about options that go beyond your usual default setting and outside of your own department or cohort. Consider the colleagues that are older or younger than you, with cultural backgrounds that are different to your own, people of the opposite gender; and make a point to take into account the quieter people. We talk a lot about diversity and inclusion but it is the everyday behaviours and attitudes that create change and make the real differences. The Nine Dimensions of Culture Harmony and Control - Tom stresses the importance of how we view the environment. The Nine Dimensions Of Culture – Relationship And Task Tom discusses the first dimension of relationship and task. The Nine Dimensions Of Culture – Shame And Guilt Tom explores the concept of shame versus guilt in our cultures. 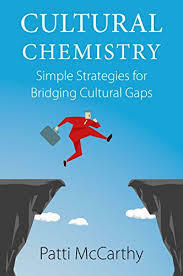 Recently released, Cultural Chemistry is a comprehensive, easy-to-read book that combines cross-cultural strategy with knowledge and provides entertaining cross-cultural short stories and anecdotes. I liked the structure and format that McCarthy threads through the book. At the conclusion of each chapter is a space to explore the 4 R’s framework. These consist of Rewards–What’s in it for you? Research–What do you need to know and why? Reflect – How do you feel about what you’ve learnt?, and Reach Out–How can you make a meaningful connection? The 4 R’s are a useful tool linking the content to the readers’ individual experiences and opportunities for making future plans and changes. Patti was a third-culture kid, has lived and worked in five different continents, lived as an expat and is a well-respected public speaker, coach and trainer. She brings a wealth of personal and professional experience and expertise to the content of this book. I am looking forward to facilitating a half-day workshop ‘How does culture influence your story’ at The Story Conference to be held in Melbourne on 23rd November. There are still tickets available. For further information click here. If you would like to hear a short interview of Tom discuss what to expect at the workshop click here.